Dental implants are great replacements for missing teeth as they are placed directly in the bone and then a crown is placed which can mimic the natural shape and colour of your teeth. They are very durable and you will be able to eat and function as you would with your natural teeth. When a tooth is lost, the bone that surrounded the tooth slowly disintegrates and leads to thinning of the jaw bone. Over time, this can affect the shape of the face and lead to movement of other teeth into the space. The great thing about implants is that they will stop the bone from being lost which most other methods of replacing teeth (dentures/bridges) cannot. Anyone over the age of 18 years can potentially have implants but we assess each case individually and a full consultation will be carried out to ensure that implants are a good and safe options for you. The actual dental implant is a small metal screw made of titanium which is placed in the bone. The threads of the screw are specially designed to encourage bone growth around them and allow the implant to ‘fuse’ to the bone. The process usually takes 3-5 months depending on the quality of the bone. The successful placement and restoration of dental implants are dependent on many factors which include your medical history, bone type and amount and availability of space to place a crown. 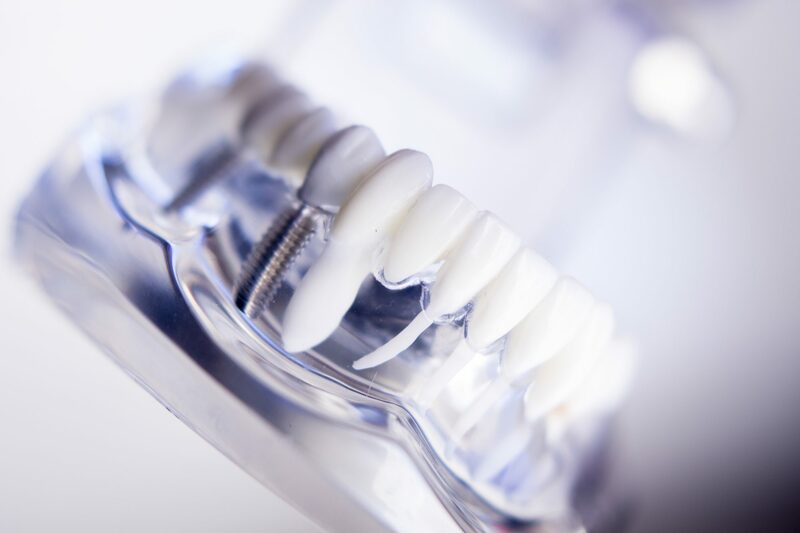 It is therefore very important for us to do a thorough implant consultation which will include checking the health the gums and tissues around the missing space. Measurements of the space are taken along with radiographs, photographs and impressions to have a model made of your teeth. Once we have collected all the necessary information, the procedure and treatment plan with the associated costs will be discussed with you in detail. In some cases, we require further information about the area and you will be referred for a 3D scan which helps to measure bone density and availability. This is a surgical procedure which lasts a few hours. You will be given local anaesthesia to ensure you do not feel any pain. You will be given the necessary antibiotics and painkillers at your appointment and full details on how to look after your mouth when you get home. We will usually see you in a few weeks to review the area and remove any stitches as necessary. You will have a small metal stud in the mouth which can be left alone, covered with a denture or a temporary crown may be placed over it. Bone will now grow around the implant over 3-5 months after which impressions are taken and a final implant crown can be placed. A small pin is used to locate the implant and a mould of this is taken with some putty to replicate the position of the implant in the mouth. These impressions will then be sent to a specialist laboratory where the crown will be carefully constructed to fit the implant perfectly. We will take a shade of the teeth and some additional photographs to aid the technician. A specialist implant laboratory is used to make the implant crown from the impressions. The process is delicate and the crown will be designed carefully to fit the missing space and the implant accurate. High quality materials produced to a superior finish are important as the implant crown is designed to be fixed permanently in place. The bite is carefully checked to ensure that the crown does not get too much force from the bite. Once the finished crown is received from the laboratory, it is fitted onto the implant in the mouth. The bite and colour are checked and you will be given instructions on how to clean around the implants. If there is more than one missing tooth, multiple implants can be placed to help with restoring a larger space. The implants provide the support for a bridge which is fixed in place and helps with chewing. The teeth on the bridge will be fused together and you will be given instructions on how to clean and maintain the area. As we get older, we slowly lose bone which causes dentures to become loose. This can really affect confidence in smiling, speaking and eating. Using denture fixative materials can help but they are difficult to clean and can be embarrassing to put on when you are not at home. Implants can help to retain a denture by providing some support. We can place 4-8 implants depending on the amount of available bone and place small buttons on the fit surface of the denture. The denture can then clip onto the implants which will stabilize it. Securing a denture in this way can be life changing if you have been struggling with ill-fitting dentures for a long time.